In practical machining, flank milling path generation methods of blade surfaces should concern machine axes’ motions to improve machined surface quality, as well as the gouging-avoidance with the hub surface and the geometric deviation constraints. The smoothness of the tool orientation in the part coordinate system cannot assure the smooth rotary axis motions of a five-axis machine tool, since the conversion of tool orientation from the part coordinate system to the machine coordinate system is nonlinear. A flank milling path is represented with the cutter reference point trajectory and the displacement curves of the two rotary axes in this research, so that the machine axes’ motions along the tool path can be directly smoothed when generating the path. The point-to-surface distance function is adopted to evaluate the geometric deviation, and an algorithm based on the differential evolution algorithm is presented to solve the distance function robustly. The sum of the squares of the first, second, and third derivatives of the cutter reference point trajectory and the two rotary axes’ displacement curves are adopted as the smoothness indicators. Then, a flank milling path generation model for blade surface smoothing the machine axes’ motions and considering the hub surface gouging-avoidance and geometric deviations constraints is developed. 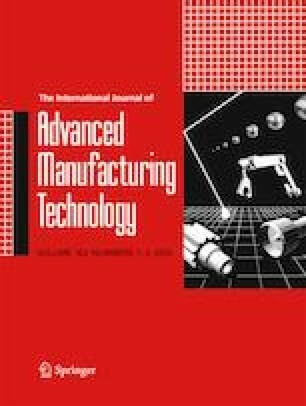 Numerical examples and machining experiments for five-axis flank milling of a blade surface are given to confirm the validity and effectiveness of the proposed approach. This work was supported by the Science and Technology Planning Project of Guangdong Province (Grant Numbers 2017B090913006 and 2016A010102019), the Science and Technology Planning Project of Guangzhou City (Grant Numbers 201504291036487 and 201604020124), and the China Postdoctoral Science Foundation (Grant Number 2018M633009).